First, let’s be clear, since I don’t want there to be any misunderstanding. There is an extensive coastline along Morocco’s most southern coast that, as of yet, I am not allowed to enter as a current Peace Corps volunteer. I want to visit Dakhla and Laayoune, insha’Allah, but I can’t. Not yet. So, this is not about the Moroccan/Western Sahara, rather this post is about the equally beautiful area just above it, the area around Sidi Ifni, or just Ifni if you look to the map on the right. It’s an odd area. Morocco is already an fascinating mix of ancient cultures, but there’s a confluence of tradition here that seems intensified. Though the Romans and Carthaginians never really came this far south, it was well-trodden by the seafarers during the Age of Exploration. 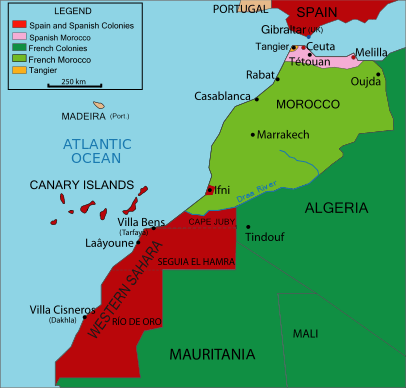 At various times and in different regions, the land along the coast has been controlled by the indigenous Amazigh people, Portuguese, Spanish, Arab, and French. Even the Germans and English wandered by here and there. Each, it seems, found these southern shores particularly interesting, so former colonial borders run amok and overlap. The largest city in the area is Agadir, situated about 2 hours north of Sidi Ifni. An earthquake leveled about 70% of the city in 1960. As part of a rebuilding effort, much of the city is newer construction. Already a resort destination before the earthquake, part of the renewed growth can be attributed to the city’s re-emergence as resort community for European tourists looking for temperate climates, affordable accommodations, and lovely beaches. In some ways, Morocco is to Europe what Mexico is to America. Of course, with the tourists comes the tourist trade which at times can feel aggressive, sort of like Marrakech with a beach. I’d come here to do some presentations for Moroccan teachers and teachers in training about the benefits of incorporating mindfulness practices into Moroccan classrooms as a way to enhance critical thinking. When the offer came, I jumped at the opportunity to escape the desert heat for a few days. After the conference, which went quite well, I journeyed south. My first stop was by beautiful accident. West of the inland city of Tiznit is a lovely beach town called Aglou with a beautiful boardwalk along its entirety. It was Ramadan, so not much was happening, but I could tell this would be a busy place once the fasting ended. 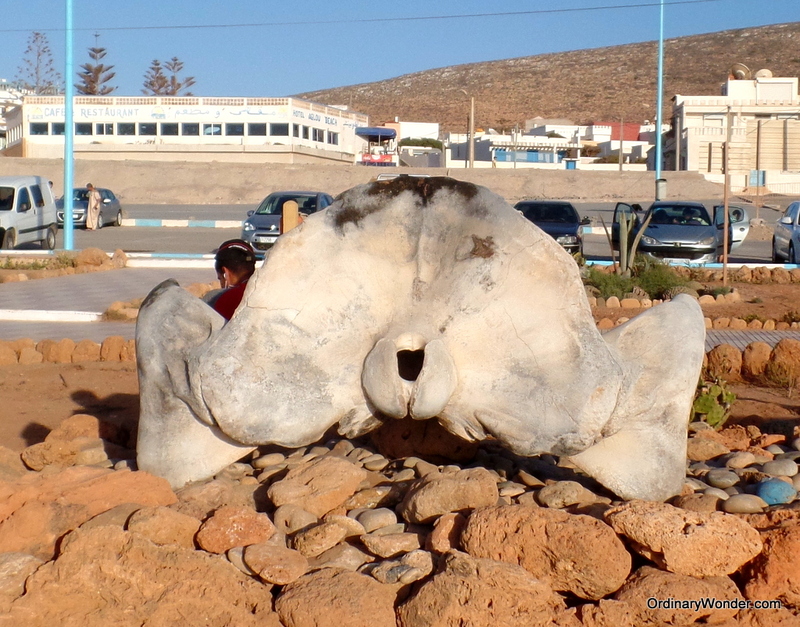 In the little park near one end of the boardwalk was a whale vertebra that had washed ashore many years before. It was an interesting reminder how truly massive those animals are. If you look closely in the photo, you can see the young man seated behind it. The next major town after Tnine Aglou, is Mirleft. This is where I spent the night. Much of the southern coast is a surfing destination with Mirleft being one of the more popular spots. for $20, I rented a great little apartment for the night complete with a large, well-furnished kitchen. It being Ramadan, I went to a local restaurant to break the fast along with other Westerners, two retired couples, one from Australia and one from New Zealand. It was fascinating to listen in on tourist interpretations of Morocco having lived here now for more than a year and a half. I had had come a bit later that the other Westerners since I was fasting and waited until after the breakfast prayer. Once the restaurant staff had quickly eaten their dates and milk, they began serving the other couples, but knowing I was fasting as well, they quickly dropped off some dates at my table. The Australian couple had ordered a tagine, or tajine, which, for those who don’t know, is perhaps best understood as a sort of a stew without much liquid that is served in the dish in which it was cooked. Usually, there is some sort of meat at the center upon which a variety of vegetables are heaped, then it is covered and cooked. The waiter set the pot down and removed the cover as steam billowed out from the sizzling dish and as he turned to leave, the woman said to him, “We’re sharing this.” He looked baffled. Again, he looked baffled. Again, I imagined his thinking, “Why do you need separate plates to ‘share’?” But, he brought them nonetheless. I left early from Mirleft and headed south toward Legzira Beach. 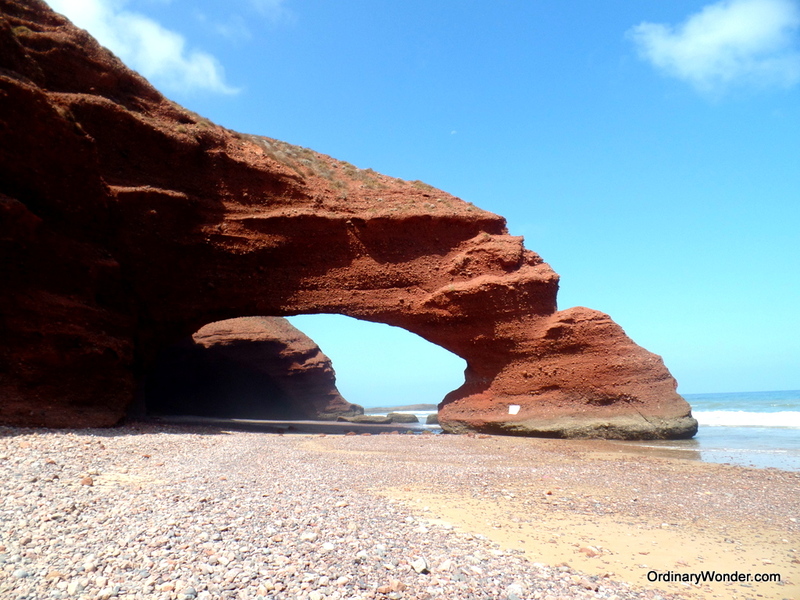 It’s a famous area due to the presence of two large natural arches formed by the unique erosion patterns of two bluffs that protrude into the ocean. Again, with it being Ramadan, the beach was virtually empty. Only a few fishermen were out catching food for breaking the fast later in the day. Aside from them and one solitary dog, I was alone with the grandeur of nature. The arches are massive. The larger of the two extends well into the surf. Walking below it, one can see how loose the soil is. I was a bit concerned about the thousands of stones seemingly ready to fall at any moment. Some of them were large enough to kill a person. The second was smaller and more eroded. It reminded me of an elephant dipping its toes in the ocean. It’s well worth a silent, meditative late-morning stroll. I continued south toward Sidi Ifni, a former Spanish enclave, much like present day Melilla and Ceuta in the north. Throughout the town are remnants of it’s former self. Though much of the more recent building reflects Moroccan standards, one can still see older buildings that look distinctly Spanish. For me, the most striking remnant is a a large platform standing just offshore that was used as a loading/unloading dock for goods brought to and taken from the area. Since the shore is quite shallow, larger boats would tie up at the platform while materials were carried by cable to and from the shore. If I had more time, I would have liked to stay here overnight and explore, but I had to be satisfied with an afternoon stroll along the beach. I had some great conversations with locals. They were all justifiably proud of their little city. It was quiet and beautiful. I could definitely see myself living here or somewhere else along this lovely stretch of coastline where the climate is always wonderful and temperate. Living in the desert, where as I write this it is 105°F/40°C outside and 95°F/ 35° C in my apartment, has helped me both appreciate the strength and determination of the people who live here, but also how much I miss living near water. Legzira Beach or the profile of an old man?